Close examination of spiral galaxies show that most have a complex structure that includes many spurs or short bridges that connect the major spiral arms. This is also true of the Milky Way, as can be seen, for example, in the Face On Explorer. In particular, there are several long and warm spurs of atomic hydrogen between the Perseus and Sagittarius arms. The longest of these, the Orion spur, contains the Sun. The Orion spur originates in or near the Sagittarius arm and crosses both the Perseus and Norma arms to terminate in the distant outer galaxy. The region between the Perseus and Sagittarius arms includes two other large spurs, the Cygnet and Vela spurs, and many short bridges. The Shepherd spur appears to connect the Norma arm to the galactic ring in the inner galaxy. In addition to these larger structures, the Face On Explorer reveals many shorter bridges or "feathers" between the spiral arms in the outer galaxy. Most of the description of the spurs below is based upon original analysis of the LAB velocity survey data rather than published papers. The model of the spurs that I am using in this analysis is consistent with the LAB data, given the rotation model I have adopted (8400 parsecs to the galactic centre and a rotational velocity of 254 km/s). However, there is very little parallax data available for the spurs and this model will likely need to be adjusted (possibly substantially) when more parallax data becomes available. The image on the left shows the expected velocity of the spurs using the rotation model described here. The image on the right shows the actual corresponding velocity data. The outline of the expected velocity is combined with the actual data for easy comparison in this much more detailed Velocity Explorer image which allows you to cross fade between the combined expected and actual data and the standard LAB velocity image. There is a complex system of spurs on the near side of the Milky Way. The Orion spur is the largest and best known of these, but there are several others. The tab interface below lets you highlight each spur. They are described in the text below. 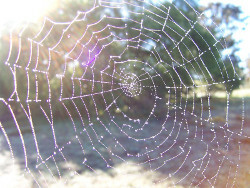 Many spider webs and spiral galaxies have similarities, including a spiral structure reinforced by spurs. The velocity structure of the Orion spur is complex because the Sun is located within it, and so gas from the spur can be detected everywhere in the sky. The Orion spur appears to originate in or near the Sagittarius arm. As mentioned in the section on the Basic plan of the Milky Way, two sources suggest an origin in or near the great W51 complex of star formation regions at a distance of about 5000 parsecs, while a third source suggest a closer origin. The model discussed on this site shows an origin at a distance of about 4650 parsecs, so a bit in front of the W51 region. As the Orion spur bends toward the sun, it contains the Cygnus complex of star formation regions including Cyg OB2, one of the most massive star clusters in the Milky Way. The Cygnus star formation regions are located at a distance of about 1400 parsecs, near the intersection of the Orion spur and the Perseus bridge, a short spur that connects the Orion spur to the Perseus arm in the second quadrant. A 2004 paper [McClure-Griffiths, et.al. 2004] describes a "a distant extended spiral arm in the fourth quadrant of the Milky Way". The diagram included in this paper actually includes extensive hydrogen in the third quadrant as well. Most if not all of the hydrogen associated with the distant arm in this paper appears to be identical with the hydrogen associated with the Orion spur outside of the Norma arm in my model. The Vela spur is a long straight bridge which originates near the Sun in the third quadrant and terminates in the Perseus arm in the direction of the constellation Vela at a distance of about 6300 parsecs. The Vela spur also contains significant molecular gas and is often called the Vela molecular ridge. It contains the star formation region Vela OB1 at a distance of about 2000 parsecs. The Face On Explorer also shows a large concentration of warm atomic and molecular gas at a distance of about 5400 parsecs. The Perseus bridge connects the Orion spur to the Perseus arm in the second quadrant and can be seen clearly in this Velocity Explorer image. Distances to star formation regions that appear to be at the origin and the terminus of the Perseus bridge have been measured accurately using radio parallax. The origin of the Perseus bridge is near W75N (1320 pc) which is associated with the massive Cygnus complex of star formation regions. The bridge appears to terminate near IRAS 00420+5530 (2170 pc) in the Perseus arm. IRAS 00420+5530 lies well below the galactic plane and it would be interesting to examine the Perseus bridge structure in more detail to see if it bends downwards. The Bridges region contains four smaller spurs interconnecting the Cygnet spur, Perseus arm and Sagittarius arm in the first quadrant inner galaxy. The region can be seen in this Velocity Explorer image. Our view of the far side of the galaxy is more affected by velocity compression than the near side, so less information is available about the arms, and especially the spurs. One significant spur is apparent: the Shepherd spur. Identifying structures in the inner galaxy velocity data is a major challenge because the blending of structures at near and far distances creates a "double exposure". The challenge increases close to the ring and bar regions because they are also subject to significant velocity compression. Nevertheless, the LAB data appears to show a link between the Norma arm and ring from about 333° to 337° Moreover, there is structure that crosses the Norma velocity loop at about 328.5° that appears to be distinct from the Norma arm. I have modelled these structures as a spur linking the ring and Norma arm with a hook at one end. It resembles a shepherd's staff and so I have called it the Shepherd spur. You can switch between the Norma, Shepherd and ring velocity structures using the tabs below. You will notice some overlap in the velocity. This is partly due to velocity blending in the inner galaxy and also because of a physical overlap between the spur and the other structures. You can see the edges of the modelled velocity (orange edges) superimposed on the actual velocity associated with the Shepherd spur in this Velocity Explorer image. The close match provides some evidence for the reality of the Shepherd spur. Delphine Russeil has identified several major HII regions in this area [Russeil 2003, figure 5]. Russeil places the origin of the Perseus arm here rather than a spur, however. In the model on this site the Perseus arm begins closer to the galactic centre direction at 342°.